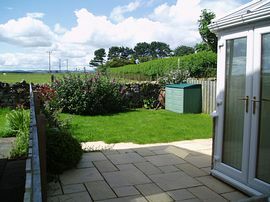 This attractive, 2 bed roomed semi-detached house is situated in the coastal village of Beadnell. It has a newly installed conservatory and a quiet enclosed garden which overlooks the fields and Cheviot Hills. It offers a peaceful way of living in a quiet cul-de-sac and is only 5 minutes stroll to the beach. Accommodation Sleeps 4/5. Living/dining room with 2 cream, leather sofas, dining table and chairs. This comfortable room has a colour TV + digital free view box, Video and DVD player. It is heated by storage heaters. 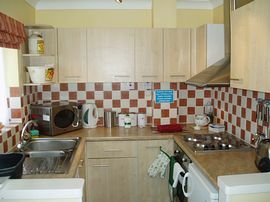 Fully fitted kitchen - well equipped with electric oven and grill, microwave, fridge with small freezer, automatic washer and drier, toaster iron and ironing board. Conservatory with comfortable cane 3 piece suite, coffee table, lamp and heater. LPG stove. Wonderful views over the fields. 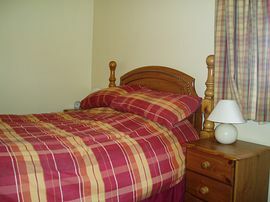 Double Bedroom - The bedroom comes with king size bed and folding bed for 5th person. Large set of pine drawers and bedside drawers. Wonderful views to Cheviot Hills and countryside. Second bedroom with full-size bunk beds, pine drawers and bedside cabinet. Bathroom - Newly refitted and tiled with bath and over-bath electric shower, whb and WC. Landing with spacious fitted wardrobes and storage cupboards. Storage heater. Porch for wet suits and outdoor clothes. Shoe rack. Timed electric storage heating throughout, with additional LPG Gas Stove. Full double glazing and insulation. The coastline of North Northumberland is well known for its sandy beaches and beautiful scenery and magnificent castles. Beadnell is an ideal place to explore everything that the Heritage Coast has to offer. Boat trips to the Farnes can be arranged from Seahouses, 2 miles north of Beadnell. There are interesting market towns in the region. Alnwick with its majestic castle, famous gardens and weekly market is only 12 miles away. Morpeth and Berwick both a scenic 25 mile drive. Holy Island is not to be missed. This area has something to suit everyone and it is a great place to unwind. 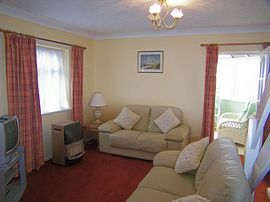 Short breaks are available out of season phone for availability. In Season please check for late availability. Booking forms and additional information may be obtained from Judith Bell-Taylor by Telephone or Email. details below. Beautiful Views form the house and garden. Close to beaches and village. 1 or 2 house trained dogs dependent upon size. 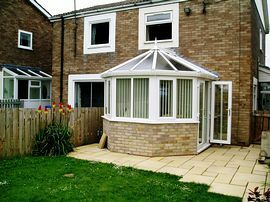 Enclosed rear garden with furniture. Off street parking for one car. Another car can be parked on the road. £225.00 - £550.00 per week. Short breaks available out of main season. "We had a lovely holiday in your comfortable cottage. Hope to come back." "Enjoyed our second as much as the first one."